↑ Asari, Y; Yanagawa, H.; Oshida, T. (2007). 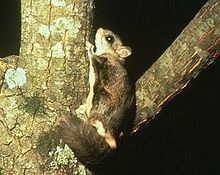 "Gliding ability of the Siberian flying squirrel Pteromys volans orii" (PDF). Mammal Study. 32 (4): 151–154. doi:10.3106/1348-6160(2007)32[151:GAOTSF]2.0.CO;2. Retrieved 2009-07-14.